It’s the first time for JCA to design red envelopes, and we prepare a surprise for all our friends. This year, we would like to invite all of you to scratch off the unknown, say goodbye to the past, and let’s find out the great fortune in 2019! May your days glitter with surprise and unforgettable moments of happiness! Taipei Shanghai Forum 2018, JC Architecture redesigning the graphic image of another historical forum where the two cities come together. As this year's theme evolves around circular economy, we focus on the idea of bricks (old) and glass (modern), redesign these two contrasting materials into a mobious strip, forever intertwining culture and future, together. Happier café, designed and built in Taiwan from 2016 for a 6-month installation inside an old air force library in the middle of Taipei. The project won lots of international awards, such as Japan GOOD DESIGN Award, American Best of year Award, IIDA Interior Design Competition, INSIDE Award, Taiwan Interior Design Award, China I-ding International Award, Golden Pin Award, etc. As a short-term project, Happier cafe ends is 2017. But this year, Happier café is invited by 2018 DESIGNART TOKYO, going to exhibit in Tokyo Midtown! With new material to reproduce Happier cafe in Tokyo, we hope to bring a new perspective of Taiwan to Japan, and look forward to bursting different thinking for both of our countries. Welcome to visit and enjoy it! JCA is always trying to reach out to the world with designs, and find opportunities that can collaborate and share our vision across the globe. 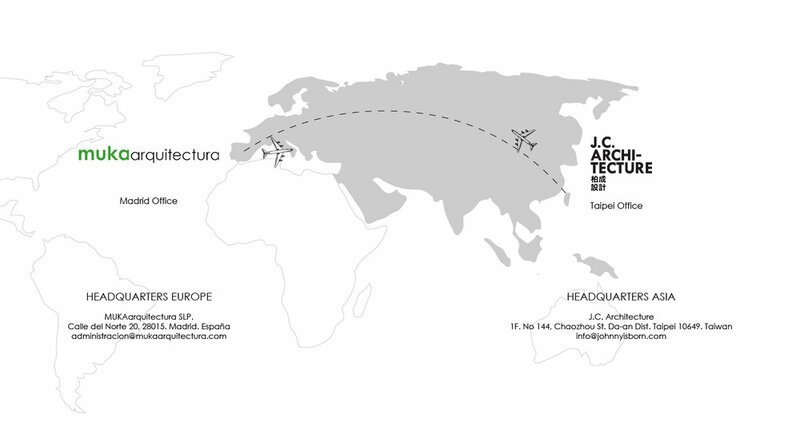 We are excited to announce the great news that we have just signed an agreement with MUKAarquitectura of Spain to collaborate projects that will span from Asia to Europe. Johnny Chiu has known Moisés Royo Márquez, the founder of MUKA over 10 years, an award-winning architect and practice that has been able to redefine the new Spanish design. During this summer, JCA will have 2 MUKA employees in Taiwan to be working together on several projects, joining forces and fostering cultural and technical exchanges between Taiwan and Spain. What that means is that investors that want to work in Asia and Europe can leverage our joint infrastructure to address projects globally. The future is always born of new alliances that strive to facilitate communication and work. On behalf of Taiwan, Johnny is invited by SIDS(Society of Interior Designers - Singapore) to share his perspectives in East Gathering. East Gathering is a multi-cities and cross-cultural event featuring top interior designers from Singapore, Hong Kong, Japan, Korea and Taiwan. The inaugural East Gathering kicked off in Hong Kong in December 2010 and has been taking place in several countries annually to present a series of design events, including forum, workshop and exhibition. For the first time, Singapore is co-working with four Asia cities from Hong Kong, Taiwan, Japan and Korea to create an interior design forum. Celebrated Designers from 5 of the Asia’s trendsetting design hubs, present their response to the challenges and opportunities of designing in today’s multi-faceted, fast paced environment. If you happen to be there, don't miss Johnny's interesting sharing in Manila! We are pleased to announce this year, JCA already won in total 10 International Architecture and Interior design awards! Awards including winner of iF awards, IIDA Interior Design Competition, Japan Good Design, INSIDE World Festival of Interiors, Hong Kong Design For Asia Awards, two Taiwan Golden Pin Design, and Taiwan Interior Design award winner, Singapore Interior Design Awards. 1.2km of recycled paper is used for remembering the past of this once important historical site of papermaking- Chung Hsing Paper Factory. It is a celebration of what was once here, and to bring back memories to the neighborhood, allowing the paper to once again come to life, this time not as a plane, but a space that can be experienced and interacted. J.C. Architecture is a multidisciplinary design firm that projects include architecture, interior, industrial, visual design and jewelry design based on New York and Taiwan, collaborating with clients from various industries. Imperfection is Perfection! Happy Chinese New Year!